The Russian Social Ecological Union has held the seminar "Climate change: impacts and adaptation, approaches to regional climate strategies" on 27 October, 2014, in St. Petersburg. The seminar showed expert opinions on risks and damages from climate change, and the necessary adaptation measures, especially in coastal regions. 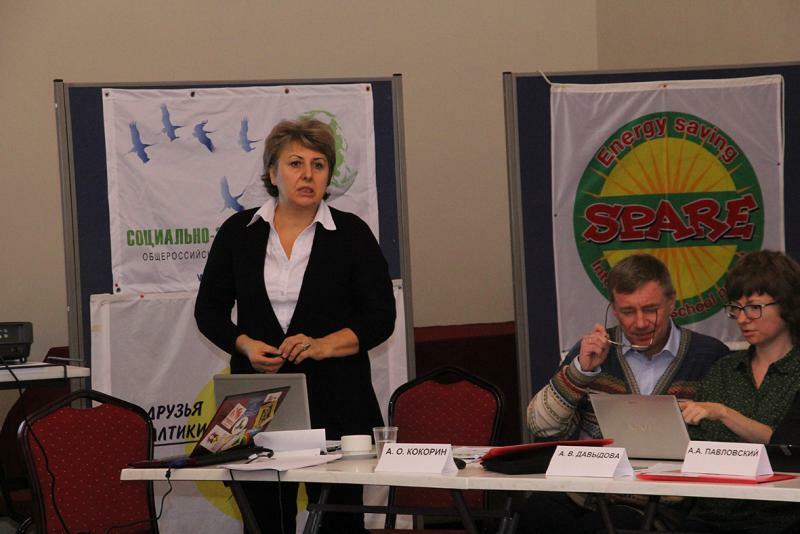 The Russian Social Ecological Union provided an overview of climate programs in Russian regions and prepared the Position for the upcoming UN climate negotiations in Lima. The seminar was organised by the Friends of the Baltic NGO and the Russian Social Ecological Union, with the support of the Consulate General of Finland in St. Petersburg, the Norwegian Society for Nature Conservation, and the Russian-German Bureau of Environmental Information. The speakers included experts from different regions of Russia, representatives of academic institutions, governmental bodies, and non-governmental organizations. Alexei Kokorin from WWF-Russia gave a presentation with comments to the IPCC Fifth Assessment Report. The most important of the report is that it shows, on behalf of hundreds of leading scientists from around the world, that there are no longer any doubts about climate change, the climate becomes increasingly unstable, and the number of severe weather events increases. The significant contribution of human activity adds to natural causes of climate change. Scenarios for future climate change, especially after 2050, depend significantly on global growth of greenhouse gas emissions. Therefore, international agreement on limiting emissions by all countries becomes especially important, as well as national programmes to reduce emissions. Alexander Fedorov from the Climate Secretariat of the Russian Social Ecological Union gave an overview of climate change in the Baltic and Barents regions. Scientists note a clear upward trend in the sea temperature, and reduction of ice cover since the second half of the 20th century. Severe weather events, spring floods and other effects of climate change causing negative social and economic effects become more frequent. Forecasts of climate change by 2030, by 2050, and by 2100 were presented, and recommendations for priority adaptation measures were given. Anton Pavlovsky (Research and Design Centre for the St. Peterburg Master Plan) presented materials on adaptation of Russian cities to climate change. Climate change affects both the construction industry, modes of water bodies, condition of cultural monuments, transport infrastructure, and wildlife. All these areas need adaptation measures and revision of standards, technologies and management. St. Petersburg has relevant problems of coastal degradation of the Gulf of Finland. On the north shore (near the village Komarovo) and on the south shore (at Krasnoflotsk), there are areas where the shore has retreated by more than 10 meters. Risks of flooding in some areas increase, and development of a whole range of response and adaptation measures is needed. Ivan Serebritsky (the Committee on the Environment, Environmental Protection and Environmental Safety) presented practical recommendations on adaptation of the St. Petersburg urban environment to the climate change. These recommendations have been elaborated in the ClipLivE project within the framework of ENPI cooperation program between Southeast Finland and Russia and will form the basis for the currently developed Climate strategy of St. Petersburg. Sergey Shaphaev from the East Siberian State University of Technology and Management and Buryat Regional Association on Lake Baikal made a report on legal aspects of ecological and climate adaptation of hydropower plants. He showed that research of aquatic ecosystems in southern Siberia and the Far East illustrates that seasonal variations of controlled levels in hydroelectric reservoirs adversely affect fish spawning and wetlands estuaries - tributaries of reservoirs – as compared to the natural regime. Risks of extreme situations are not adequately addressed in the regulation of hydropower, and this adversely affects the biodiversity of aquatic and semi-aquatic ecosystems, and increases the risks for settlements. Adaptation of control systems for overregulated aquatic ecosystems is needed: the maximum preservation of conditionally natural water regimes in hydroelectric reservoirs on the basis of environmental monitoring. Tatiana Shauro (Friends of the Baltic) provided an overview of climate actions in the regions of Russia, which was made on the basis of a survey conducted by RSEU in 2014. Official answers by regional authorities about implementation of the Climate Doctrine of the Russian Federation showed that less than 10 % of the 66 regions (which have answered) have their own plans and programmes on climate change adaptation and reduction of greenhouse gas emissions. About 25 % of the regions indicated some actions in the field of energy and environmental protection, which indirectly address the needs of adaptation or help to reduce emissions. Responds by the rest of the regions showed that the level of understanding of the objectives of the Climate Doctrine of the Russian Federation and of responsibility of the regions for its implementation is very low, and such activity in the regions is not performed. Olga Senova, the head of the RSEU Climate Secretariat, is sure that regulations with clearer responsibility of the regions for climate adaptation and reduction of greenhouse gas emissions are needed. It would be useful to disseminate the experience of regions of the Russian Federation and other countries that have established and implemented climate strategies and plans. The expert support to regional offices in the work on climate adaptation and development of climate strategy guidelines in the region are needed. Discussion at the seminar has shown that there is a public demand for adaptation actions. Monitoring of the situation is a priority for the RSEU Climate Secretariat.